The following clarifications are not intended as criticism of the New York Times or Amy Chozick. Rather they are in service to the reality the reporters and editors working today do not possess a comprehensive knowledge base for the extraterrestrial presence issues. This is a very important Times article that is much appreciated. - First and foremost, the matter in question is no longer about "UFOs." That is the language of the truth embargo. It is about "extraterrestrials" (not "aliens") and has been for some time. 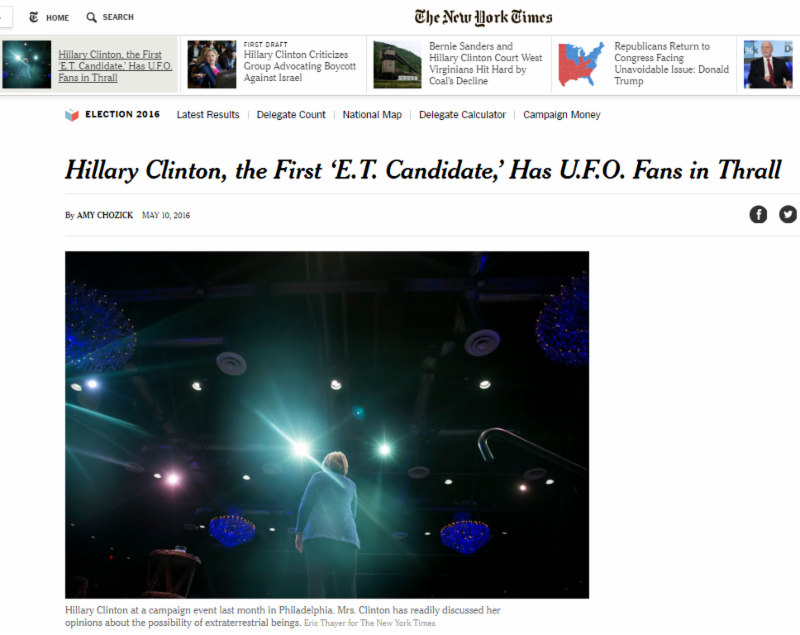 - The interest in the extraterrestrial issue extends well beyond a "small but committed cohort of voters." Repeated polling by CNN, Reuters, Roper, Ipsos and many other entities has indicated as many as 50% of the American people believe the phenomenon is real and as many as 85% believe their government is not telling them the truth about the issue. Twenty percent of the world's population (1.5 billion) believe extraterrestrials are present now. - President Obama has clearly danced around the subject in clever fashion. But the formal statement from the White House as of October 4, 2011 was no joke. It was also, on the key question, entirely false. - John Podesta was also Chief of Staff to President Clinton. - It is VERY notable Podesta declined to comment on the Times article. - As for "63 percent of Americans do not believe in U.F.O.s": Usually the question is phrased, "do you believe the phenomenon is - or UFOs - are real." 37% is the low figure now. It can poll as high as 45%. That said, 37% represents 96 million adults - 8 times the number who will vote for Secretary Clinton in the primary elections. And half of the remaining 170 million adult Americans are on the fence regarding the issue. This is hardly a minor sentiment. - The mention of the meeting with Laurance Rockefeller in 1995 was most welcome. However, what is missing is mention of the entire Rockefeller Initiative (March 1993 to October 1996). Secretary Clinton has yet to acknowledge that initiative or her involvement in it.